Chidambaram’s hand should be very good, considering that he is a top level government minister and presently holds the Home Portfolio. His hand is certainly that of a successful man, but there are certain negative aspects of his character which are clearly evident. a practical attitude and plenty of common sense. He is able to take a broad perspective on issues and will make a good foreign minister if he ever gets that portfolio. Check out a hand photograph of his, here. His thumb, Mars Mounts and fingers show an aggressive and pushy person who is impatient to get things done, takes quick decisions and likes to see them executed. He grasps problems quickly, has an analytical mind but at the same time is quick enough not to waste time in the details. When people come to him, he likes to get to the point, and likes problem solvers, not problem creators. He in interested in results. He has a strong work ethic. Yes, at times his decisions are hasty but his intention is to make a difference. His action-oriented nature is one of the best traits in his personality. 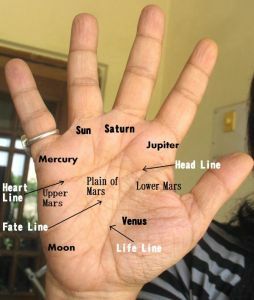 His thumb, Mount of Venus and Mercury finger show him to be a person who can get along with people, reach out to them and network well. Good qualities for a politician to possess. Chidambaram’s hand differs a great deal from that of his predecessor Shivraj Patil, who held the Home portfolio during Mumbai’s terror attacks. After seeing Patil’s hand one can understand why he was ineffective as a Home Minister. Patil's hand is that of a person who sees things from his own narrow perspective and he is consumed with how his decisions affect him rather than the country. He finds it difficult to see things in the long-term and not surprisingly, selfishness is a strong trait with him. Oddly enough, Shivraj Patil’s hand shows that he is more intelligent than Chidambaram, but his intelligence is not that of a practical kind. He tends to live in his own dream world. There are some aspects of Chidambaram’s character (as shown by his hand) which are very disappointing. His Sun and Mercury fingers show a strong desire for wealth and fame, and in comparison, less for power. This is a rather dodgy ambition for a politician to have, and unusual too, as most politicians are power-hungry. Unfortunately, this attitude will be a temptation to do something which is not always above board. Specially when one is clever enough to hide one's wrong-doings. Chidambaram's hands show that he is suspicious and shrewd person, to the point of being cunning. A person so smart that he will not be found out if he ever does something which he shouldn’t be doing. The problem is that people like him get found out when they become overconfident of their ability to fool others. His Saturn is very strong and Chidambaram has all the positive qualities of Saturn, in terms of wisdom, common sense and strong focus in life. In fact he is serious to a fault. The third phalanges of his fingers show his love for the good life. However they also show stinginess and money-mindedness. He would have been brilliantly successful as a lawyer (he started out as one and this change of career is also evident in his hand) as his hand shows not just a strong and vigorous reasoning ability but an argumentativeness of a kind that enjoys taking the opposite side just for the sake of it. He has the ability to enable him to succeed as a politician as well, and this has been mentioned above. Temperamentally, he is more suited to the profession of Law. This is because successful lawyers like money and people find this trait quite normal amongst lawyers. We may condemn a doctor or a politician for liking money, or wanting to make it, but we respect this trait in a lawyer. Or at best, we accept it. Related Reading: The hand analysis of Shashi Tharoor and Dr. Manmohan Singh, as well as that of other politicians, Indian and International. Next: The hand reading of Steve Jobs or perhaps Michelle Obama. After that, an Indian personality again, probably Pratibha Patil, the Indian President. Vishesh, thanks for your comment. Whenever we see a public persona we tend to either believe the positive and the negative, depending on our own biases. No person is completely positive or negative although there are some who have more positive traits rather than negative. Also what people see as negative traits may differ too! I am from Delhi and How to meet Personally. Thank you bindesh for your email. As of now I do not meet clients in person as I do not have an office and do not like to disturb other family members. The only hands I read at home are those of relatives or someone known to the family. My work is entirely on the web although one of these days I do plan to open up an office space. Also, there is nothing better than reading a hand from actual prints or good quality photos. This enables one to examine the lines minutely. Usually I take hours to check out one hand, and go back to it several times, and this becomes impossible in a personal reading. So from the point of view of accuracy I prefer the print/web method.